Certain products on the market claim to eliminate minor floor smudges brought by stains and spills. Some stains, however, may be hard to remove if not treated immediately or correctly. Wipe spills or smudges from floors as soon as they happen. For stubborn stains, choose the right laminate floor cleaner to eliminate not only those spots but your worries as well. Cleaning professionals do not advise cleaning your laminate floor with soapy water or a scouring agent, such as a brush. These cleaning implements could destroy the floor’s surface and dull its natural shine. The use of door mats in entrances is recommended. At first glance, these mats appear to be just “Welcome” signs at your doorstep, but they actually help you get rid of small stones and other debris in your shoes, which may damage the floor’s surface. Door mats lessen the risk of scratching or staining your laminate floor. For best results, use special products like the LamanatorPlus™ floor restoration kit. This is not an ordinary ‘OTC’ laminate floor polish; it effectively removes ingrained dirt on the floor’s surface. 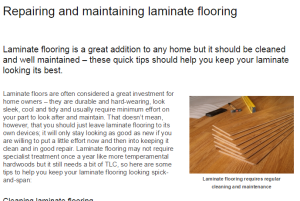 These products, from floor restoration companies like Laminate Restoration UK, will also recoat laminate and hardwood floors, and maintain high-traffic areas in the home. Laminate flooring has remained a primary choice of many a homeowner. Seeking the right cleaning implements and best practices ensures its durability and maintains the beauty of your home. 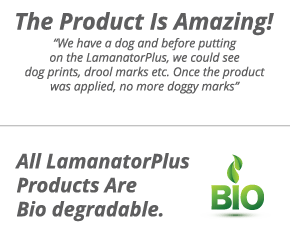 This entry was posted by LaminateRestoration in Laminate Floor, Laminate Floor Cleaning and tagged Laminate Floor Cleaner, Laminate Floor Cleaning, Laminate Floor Polish, Laminate Floor Repair System.